While author Rūta Vanagaitė who slandered partisan leader Adolfas Ramanauskas-Vanagas is travelling around the US and is telling American Lithuanians, Litvaks and other Americans stories of a supposed campaign against her in her homeland, Israel has expressed indirect diplomatic support to the memory of the freedom fighter. 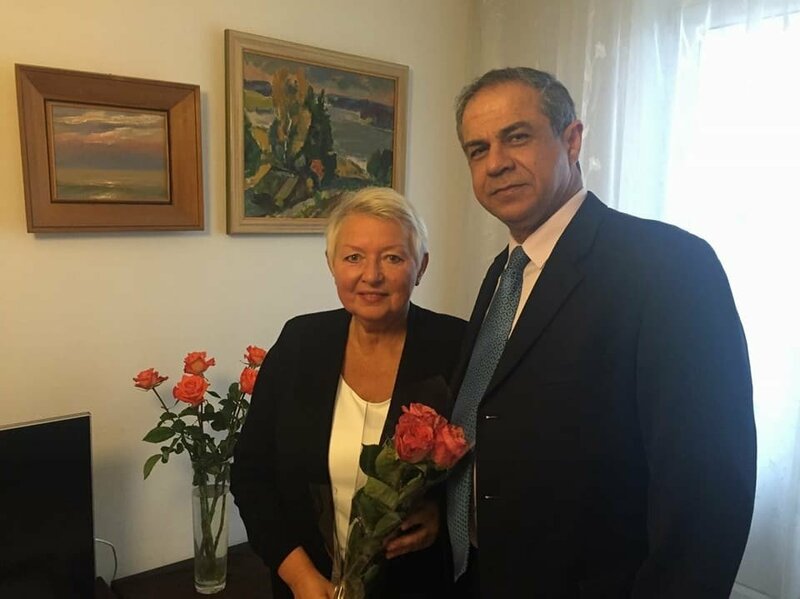 On Thursday A. Ramanauskas-Vanagas' daughter Auksutė Ramanauskaitė-Skokauskienė received an unexpected guest – she was congratulated for her birthday by the Israeli ambassador Amir Maimon. "Wishing Auksutė Ramanauskaitė-Skokauskienė HAPPY BIRTHDAY and having a very open, sincere and friendly meeting," the ambassador shared a photo with the partisan's daughter on his Facebook account. MP Arvydas Anušauskas who patiently presented arguments against R. Vanagaitė's position on A. Ramanauskas-Vanagas also shared a picture. 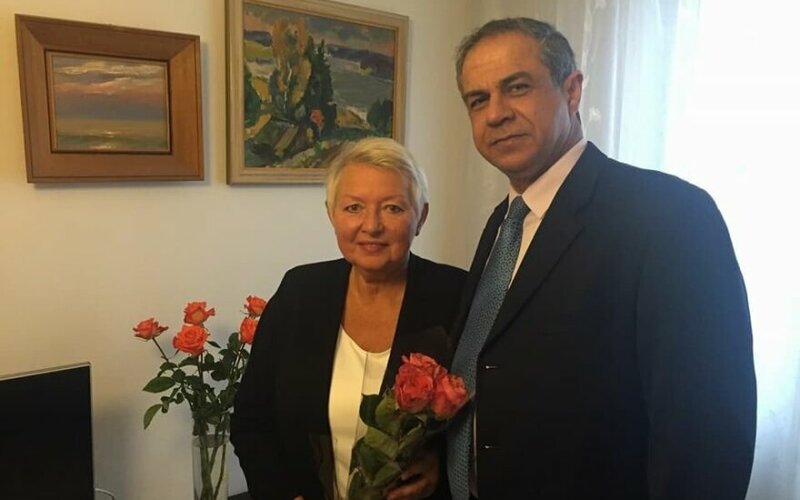 "Respect to the Israeli ambassador – today the Israeli state ambassador to Lithuania Amir Maimon visited A. Ramanauskas-Vanagas' daughter A. Ramanauskaitė-Skokauskienė in Kaunas," A. Anušauskas stated, not hiding hopes that such a public action by the ambassador could be held as a signal, which position Israel holds regarding A. Ramanauskas-Vanagas. According to A. Anušauskas, A. Ramanauskaitė-Skokauskienė herself was surprised how much A. Maimon knew of her famous father. "His knowledge of my family's history and earnest understanding and empathy of our experiences was a surprise. Flowers and birthday greetings from the ambassador were a surprise today," A. Ramanauskaitė-Skokauskienė wrote and added that the ambassador expressed an official position. "He emphasised that his state respects and values our struggle for freedom which was led by my father Adolfas Ramanauskas-Vanagas. At the same time he noted that the attacks by two individuals were purely their own. The ambassador stressed that the goal of the visit is to get to know me and to strengthen the relations between our two nations," the famous partisan's daughter said. The ambassador himself confirmed to Delfi that he is operating based on his own principles and beliefs. R. Vanagaitė publically called A. Ramanauskas-Vanagas a Soviet intelligence agent, but later took back her claims and admitted her mistake, though her partner Efraim Zuroff, who also presented suspicions of participating in the Holocaust as well and promised to present proof has yet to apologise to the partisan's relatives.